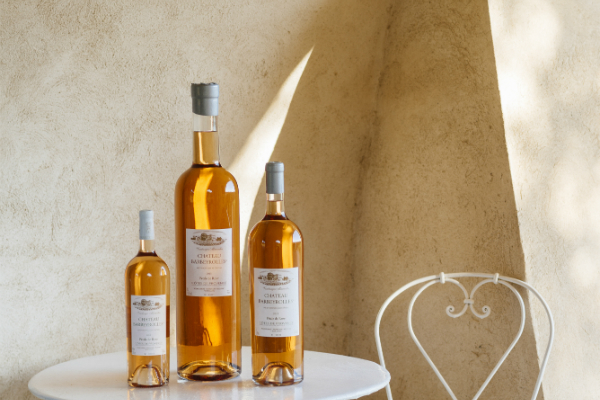 The term pioneer is often used loosely, but in the case of Régine Sumeire, head of Provence’s Château la Tour de l’Evêque and Château Barbeyrolles, the label bears no exaggeration. As one of the first female winemakers in the Provence region, in an industry at the time dominated by men, it was Régine who created the pale pink rosé colour for which the region is so well known today – Pétale de Rose. As superb and refined a Rosé as you will find in Provence, this is a wine with extreme finesse, handcrafted from old vines planted back in the 1970s. Every vintage is a blend of up to eight different grapes, each contributing something different, to achieve a similar taste. But this is no ‘Coca-Cola wine’ – even the smallest percentage of a single variety can alter the flavour profile one year to the next. Recounting the story of her first bottling, Régine attributes the christening of her famous wine to none other than Elisabeth Labruyère. Late grandmother of current head of the Labruyère estate, Edouard drew the comparison to a beautiful pink garden rose. Although apt, the rose was the symbol of France’s new President Mitterrand, and the desire to stay away from politics was strong! It was not until 1985, alongside a fantastic vintage, that the Pétale de Rose name was born. Unique at the time, the wine was a feat both in terms of flavour and colour. When asked about her ground-breaking success, she laughs, “It was just the colour of the fruit!” This is a characteristic example of Régine’s down-to-earth attitude, shining a far too modest light on her work. Achieving the delicate colour, flavour profile and refined palate structure of these wines requires pristine fruit. This perfectionist commitment to quality is evident in her vineyards. Based just a few miles from sunny Saint-Tropez, the lands surrounding the Châteaux are nothing short of idyllic. Bright sunlight radiates upon palm trees and lavender in this true Provençale paradise. 100% organic, the plots are impeccably organised according to exposition, soil, composition and structure. All grapes are picked and sorted by hand, before going through a coquard press. This is same as used in champagne, and known for its extremely gentle action, giving only the finest juice. The critical acclaim for this wine is world-wide but in some circles Rosé wines generally are still disparaged. ‘Just for summer’, or ‘swimming-pool wine’ are phrases usually associated with Rosé. Words like easy and accessible are turned into snubs – too easy, too accessible. Perhaps we mean too pink? Régine however, is no stranger to rebuff; her bid for appellation status was rejected twice due, ironically, to the pale pink colour of her wine. Her advice is to work with quiet and focused determination, and the rest will fall into place – “I sometimes ask people to taste it from a black glass! 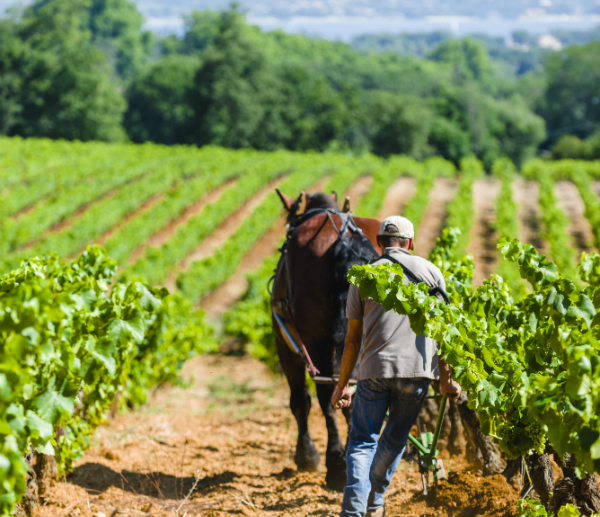 That way they will only judge the quality of the wine.” Terroir, climate and skill have all played a part in this story, but above all it is Régine’s passion for care and ultimate precision that shines through. This is just as true when it comes to food, as for Régine, wine is not the only thrill in life. The title of her recipe book “Wine grower and food lover” says it all, and we are lucky enough to be treated to a few examples from Provence. Watching Régine in the kitchen feels like being at home. She bustles around, chatting, peeling apples, telling us about her ingredients and ideas. “These are not recipes for a restaurant!” she jokes. “This is home cooking”. When we sit down to dinner, the atmosphere is the same. Her wine is made for relaxing, to be consumed with friends and family, to be enjoyed. 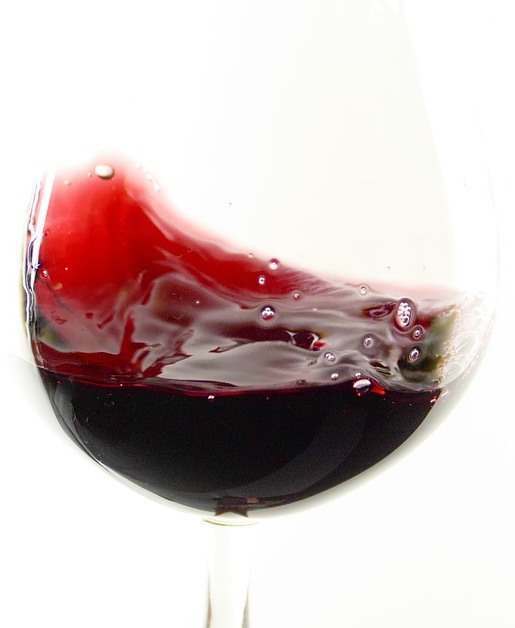 But it is still a wine, and above all, a food wine. She tells us that she insists on asking people to try her wine with a meal – fish, seafood, pastas, meats… it goes with everything! From what we’ve witnessed, this is true. 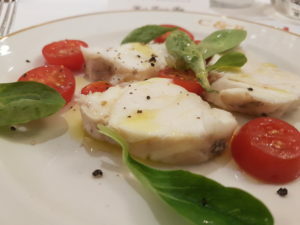 A poached monkfish salad with basil and cherry tomatoes blends well with the first Rosé from Château la Tour de l’Evêque. For mains, the slight spice in the stuffed tomatoes (or petit farcis) is brought out beautifully by the Pétale de Rose. 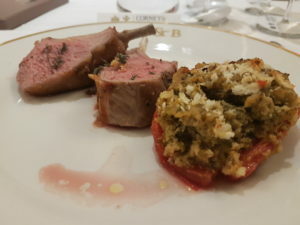 The rack of lamb, succulent and moreish is a perfect match for the slightly bolder Château Barbeyrolles. The complexities are varied, changing, and one thing is clear: not all Rosé is just Rosé. Love Rosé? Read this next!